A basic skill that trainee neurosurgeons need to gain early in their training is an appreciation of the ventricular system in the brain, and how to cannulate it in an emergency. The flow of cerebrospinal fluid can be obstructed in the ventricles by many pathological processes leading to a dangerous condition known as hydrocephalus. The pressure within the ventricles can rise, leading to loss of consciousness. The ventricular system can be cannulated in the operating theatre, fluid drained and the potentially lethal rise in pressure relieved. This procedure is a commonly performed in neurosurgical departments. 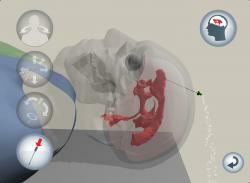 Llyr ap Cenydd, from the NISCHR funded ‘Advanced Medical Imaging and Visualization Unit’ at Bangor University, has just developed a surgical training tool for the iPad tablet called ‘VCath’, designed to take a neurosurgical trainee through the steps of positioning and inserting a catheter into the brain of a virtual 3D patient. These steps are part of a procedure called ‘Ventricular Catheterisation’, which is used to drain fluid that has become obstructed within the ventricles of the brain. 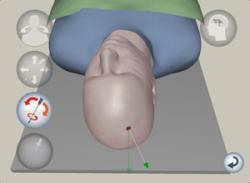 Inserting a catheter at the correct orientation and depth so that it punctures the ventricles is critical to a successful outcome for the patient. It requires the neurosurgeon to have an excellent 3D awareness as the anatomy involved is not visible during the procedure. The ‘VCath’ enables trainees to improve their understanding and skill set needed for the procedure before having to perform in the operating theatre. Training using the cost effective simulator will help to provide neurosurgery trainees with the necessary skills for safe and effective completion of the procedure. It provides a convenient platform for repeat practice, anytime, anywhere, and has the potential to improve patient outcomes, safety and experience. 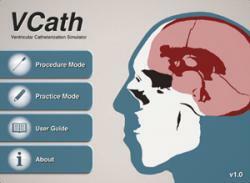 The ‘VCath’ has been developed by the Unit at Bangor University’s School of Computer Science, in collaboration with Mr Nick Phillips, Consultant Neurosurgeon at Leeds General Infirmary, and Prof William Gray, Professor of Functional Neurosurgery, Institute of Psychological Medicine and Clinical Neurosciences, Cardiff University. Further enhancements to the tool are currently being implemented. "VCath is an exciting new iPad application which allows trainees to learn the basic theoretical and practical skills of ventricular catheterisation in a realistic simulated environment. It is a valuable tool for enhancing the learning of a core skill set and is a significant advance for applying simulation to neurosurgical training"
Watch a short clip about the development here.